Do you hate ‘hustle’? Loathe ‘pitching’? Does ‘selling’ make you want to crawl under your duvet and hide? In today’s episode, you’ll discover why it doesn’t work for you – and how that’s one of your biggest strengths. Dare to Dream Bigger – page 53 – the difference between love and fear. Today’s intention: Notice how your body warns you when you’re out of flow. Listen to it today! 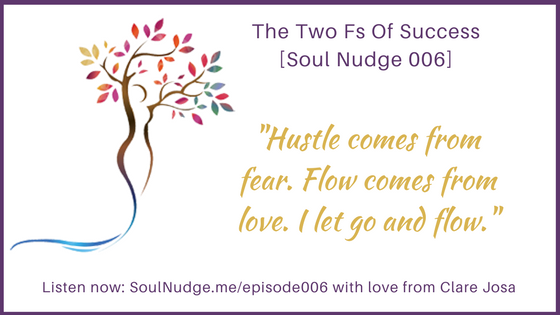 Have you been stuck in hustle and fear? How different would life feel, if you could reset your inner thermostat to flow and love? What action could you take to move towards that? P.S. Loved this? Please share it far and wide! We hate spam, too. Your email will only be used to send you a message when a new episode is published.